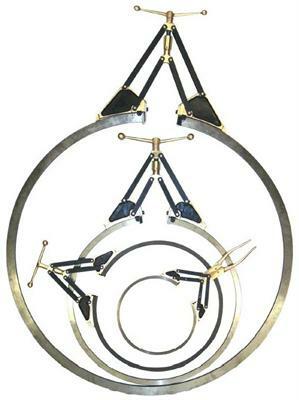 The Unistress Piston Ring Expander subject the ring to four forces as indicated and therefore to a uniform moment throughout, except at the ends where it decreases rectilinearly towards zero. Constant moment means constant stress which again means the lowest stress possible for a desired opening of the ring. Each UPRE is provided with a stop, limiting the deformation of the ring to the minimum required to slip it over the piston diameter. As a result one may count on a UPRE always being used once it has been procured. The UPRE are delivered adjusted and ready for use for any type of piston ring and diameter upward of 130 mm. A UPRE has the advantage of making change of the piston rings much easier. Even the biggest rings can easily be changed.